We finally completed our final third webinar in our social strategy trilogy. It’s been great sharing our insights and widely releasing it to the community, and I hope you enjoy this final segment. The topic? Getting your company ready internally through research, processes, organizational models, policies, resources, and more. Above: Download the slides from slideshare and use as you see fit. The “crises plan” is a slide that can be customized for your needs, just provide attribution. Social Strategy: Getting Your Company Ready, by Altimeter Group from Altimeter Group on Vimeo. Love to get your feedback, was there anything we missed? Let us know if this information helped your organization, contact me anytime if you’ve questions jeremiah at altimetergroup dot com. Our belief in Open Research means we try to collaborate with the market on conducting research, then sharing a great deal of it so the market can build on top of it, improve it, and we can continue to learn. Yesterday, we hosted part 1 of the SCRM webinar series, and have made the slides and the recording available. Social CRM Use Cases: 5Ms and Marketing, by Altimeter Group from Altimeter Group on Vimeo. Above: The webinar recording. My voice was a bit soft due to technical reasons, however at 14 minutes in I switch headsets and it clears up. This means that 28% of the attendees were interested in investing on Social CRM solutions. This is just the starting point, harness these other resources to become successful. After you’ve digested the report, and are starting to prepare for the 5Ms, approach social crm vendors with these four tips. Ask them to define which use cases they currently specialize in. Ask to see a roadmap of which use cases they’ll be launching in coming quarters. Ask how they’ll work with other SCRM vendors that offer use cases that they can’t deliver. I recently spoke to the global marketing team at a large technology company, and one of the questions being wrestled with was deciding if social media efforts should be setup by brand, vs product teams wanting to create their own unique pages and experiences. A specific question emerged “Should we setup our efforts by product type or by brand?” There are drawbacks and upsides to each of these, and I wanted to layout the ramifications. Companies that choose poorly will have wasted internal efforts and resources, set up false expectations for customers and may struggle with trying to redact a program in public where customers are already assembling. In particular, social failures like Wal-Mart’s branded community ‘The Hub’ have now become a case study of doing it wrong. Yet having no strategy means that product teams, regional teams, and individual regions will do whatever they want –causing clean up for corporate late. Lifestyle Brands created lifestyle communities such as communities for Wells Fargo’s teen, Amex’s small business owners, or even by cultures like Asian Avenue or BlackPlanet Staying power. By joining customers in the way they already self-organize you’re matching their existing needs –beyond your product push Off message. Less control over the conversation which may extend beyond your brand and products and talk about what matters in their life. Product focused teams may not have right mindset ‘customer-first’ mindset. First, find where they may already exist and consider joining. Create your own lifestyle deployment only to meet an unmet need. Often this is at the mouth of the marketing funnel. Product Building a Facebook, Blog or Twitter feed for a specific product or product line. See the Playstation blog, Doritos Facebook page, Specific info. Meets the needs of the Product Marketing Manager to give tight information about a product Granular and insular. Lack of customer focus and risk of investing in a community that could become irrelevant if the product reaches end of life. Lack of solution sell to lifestyle as consumer may want to purchase several products. If your product has staying power and a thriving community around it (like Xbox, PS3) with sub products around it it may make sense. Consider this towards the bottom of the marketing funnel, or even customer support. Location Restaurants, hotels, and retail stores may want to create their own Facebook, MySpace, Yelp experience. Or specific regions may have different product sets and create their own communities to meet a unique culture. See Four Seasons Twitter index Hyper targeted. Local markets may benefit from geo location marketing as location based social networks like GoWalla, FourSquare, MyTown, and Yelp grow. Provide unique local experience. Lack of control. These individual pages may be setup by the managers daughter and lack true long term resources or ability to fend of sophisticated situations. Danger in these sites becoming abandoned over time, with no clear way to retire them without community backlash. Likely, this is already happening. Get ahead of it and provide the right training, processes, and hotlines for these disparate groups to have autonomy –but within clear set of guardrails protecting your brand. First, be customer focused. Companies should first identify the social graphics of their customer base to understand where they are online. Secondly, they should understand their social behaviors, who influences them, and how they influence others. In most cases, customers have already assembled their own communities and analysis should be done on how to join them where they already are. For best results, use in combinations. Rarely is the world an ‘or’ but an ‘and’. Companies should know when to use these in an orchestrated combinations. Sophisticated social strategists are mapping all of their programs against marketing funnels to know which tool should be used during what customer phase. Think long term –not just by campaign. Don’t launch short term social efforts unless it’s just around a single event and the expectations are clearly set up front. Grown fans, followers, or subscribers is an investment that will cost you, so plan on doing this for the long term –not a short one-off campaign. Remember, in most cases, customer communities have been here before your brand was on the social web, and likely they will be here after your brand. Recently, I spoke to a crowded room of senior marketers at a CPG retailer, one of the executives asked “What’s an indicator a company is advanced in the social space?”. I gave three answers, and one of them was “Developing a thriving unpaid advocacy program to evangelize for you and fight your battles.” The executives, which were used to traditional advertising and direct marketing had a lightbulb go off as I showed them this following framework. Companies struggle to quickly respond to the assault of customers who are constantly dialoging in social channels, they simply can not hire enough community managers and the promise of Social CRM systems are in its infancy. Additionally, the old school thinking of traditional marketing which puts the sole focus on the branded voice of corporate communications, and polished, sanctioned executives. Yet now, as social tools are pervasive (take a look at all the people accessing Facebook from their mobile phones) the gateways of public communication have given anyone the opportunity to communicate. Brands must extend their strategy to the outside rings. In order to scale in both time and mass, corporations must now extend their communication strategy beyond just corporate communications and sanctioned ‘company representatives’ to include the other rings in their communications mix. In the following graphic, the “Rings of Influence” I’ve mapped out how other roles can and should be used in the communications strategy. I’ve worked on trust research, and found that in most cases the closer in the rings (corporate) there’s less trust. Other studies, like Edelman’s 2010 trust barometer indicate similar findings as the most trusted relationships are at the outer rings, see figures 7 & 8 in this PDF. Prospects: Those that are not yet customers. Engaging soon-to-be-customers during their problem and pain stages and focusing them on your solutions is the goal. Build lifestyle communities to engage them in a ‘bigger-than-brand’ discussion such as CVS’s community for caretakers. You’ll really need to let go of hard marketing styles and focus on what IBM’s senior marketer Sandy Carter calls “light branding.” Make sure you have a community kickstart plan. Customers: Existing buyers, some which are highly engaged and vocal in your space. Enabling the voice of the customer has been a mainstay belief for product development, but most companies have not harnessed them for marketing and support. Build an active advocacy program that encourages them to fight your own battles like Intel Insiders, Microsoft MVP, Wal-Mart’s 11 moms program. Bazaarvoice enables companies like BestBuy to have ratings and reviews on their site –increasing flow through funnel Customers will love and hate you alike. If you harness their voices, expect to let both types of information come through in a strategic way. The trick? Use complaints as an opportunity to show openness and customer response in public. The savvy brands will trigger advocates to deal with detractors, use this checklist to get started. Corporate: The traditional and centralized communications group and sanctioned executives Corporate comms can benefit from social tools that allow the spread and sharing of company messages, and they can also build a social platform to stand on in order to fend of critics See how SouthWest Airlines has built a corporate blog for years, which gave them the standing power to fight back against detractor Kevin Smith. Also, see how Domino’s President used online video to respond in a human and more trusted way during an employee health crises. Lots of retraining when it comes to rethinking the approach in this space. Stop and breath, develop a measured set of steps a framework, control is not completely lost if you have a balance. This is an opportunity more than a threat. Recognize that greater opportunity is abound at outer rings –but comes with increased risk. Brands are most comfortable operation in the inside rings, like ‘Corporate’. 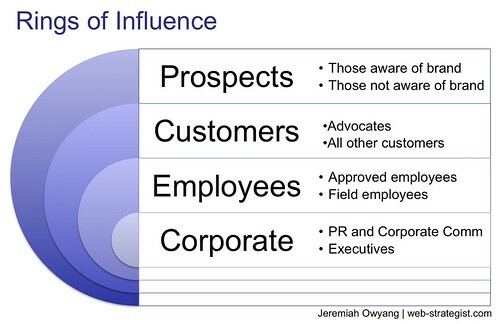 Yet the greatest opportunity to leverage trust and reach happens at the outer rings of influence with ‘Customers’ and ‘Prospects’. Of course, with a greater benefit comes greater risk as there’s less control over conversations on the outer rings. Analyze your existing social marketing programs. From Facebook, community, Twitter, to Gowalla, brands must take inventory of each of their existing social programs. Pull out a spreadsheet and map which each of your social media programs are doing, look at both: 1) Which ring is the primary publisher, 2) Which ring are they trying to reach. Be pragmatic, and develop a roadmap: start with smallest ring and move out. Don’t jump on the largest ring of prospects without first getting grounded. Start at the inner circle and work your way out, by building a foundation at the core and building on success and safety in experience. Companies that try to address prospects but lack the internal resources and ethos to deliver may find themselves offering false promises. This single graphic represents an entire presentation I’m developing for internal client workshops or keynote presentations at marketing and business conferences. I love to share, and want to get your feedback in the comments below so I can improve it. Update: Mitch has also extended the conversation in the Social CRM pioneers Google Group, watch it unfold and participate in the group.